To make a mosaic, artists would place colored fragments of a durable material like stone or glass in a sequence that transformed the individual fragments into a unified geometric or figurative design. 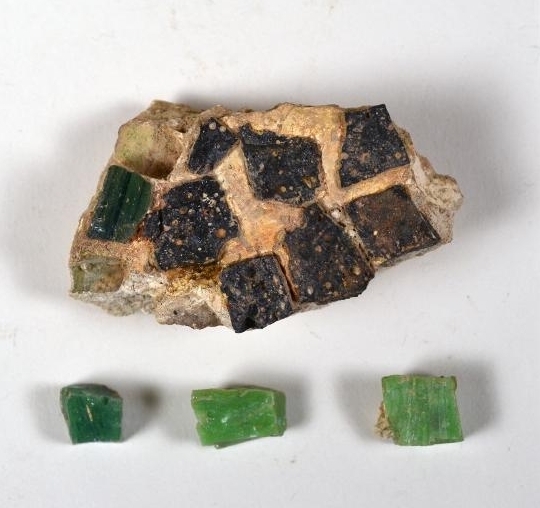 In addition to completed mosaics, archaeologists excavating Beth Shean found glass and stone tesserae (the component parts of a mosaic), as well as uncut pieces of glass and stone in spaces where the works were made. By studying these objects, we can gain a better understanding of how mosaics were produced and what full decorative interior environments may have looked like. Wall mosaics, in particular, were not found in situ, but fragments of glass and gilded tesserae were found near the Round Church and by some of the elite houses.